This pair of twenty-inch-long swords with single leather scabbard gives today's kung fu adepts the modern combat version of an ancient Chinese weapon. Cold Steel's versions of these wide blades weigh more than a pound each with fifteen inches of cutting edge and blade stock 1/5-inch thick. The 1055 high carbon steel holds an edge well and has enough tensile strength to stand up to extensive use, in cutting practice as well as kata. Welded construction creates a one-piece weapon with hand guard and quillion solidly joined to the blade, bolster, and pommel. The traditional shape of the quillion provides hand protection, parrying ability, and twisting force for disarming moves. The sword set includes a good leather-bound scabbard which hangs from belt or sash. A unique feature of the Butterfly Sword system is that both swords are shaped to nest together in one scabbard. The cord-wrapped hardwood handle grips are D-shaped in cross section, and the two swords mirror each other in profile. In the scabbard, the two blades look like one weapon. The Butterfly Swords may have been invented by Shaolin monks. Monks carried them hidden beneath their robes and sharpened only part of the blade. The original intention was to wound or disarm, not to kill the opponent. 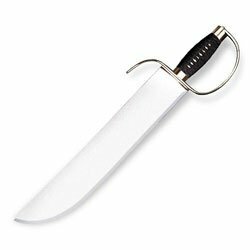 The efficiency of the system soon made it popular among others with more lethal purposes -- these blades are sharpened for the full length of the cutting edge.